guardians against cyber threats and protectors of digital data. a rigorous program that teaches students how to professionally lead cybersecurity strategies and manage a cyber-crisis. a leader in the cybersecurity industry who plays an important role in defining cybersecurity policy and response at a local, state and national level. As the world’s data has shifted from physical storage to the cloud, companies and organizations are increasingly at risk of attack, leading to unparalleled damage to their revenue, reputations and integrity. Clear cyber strategies are vital in order to protect corporate and customer data, as well as critical infrastructures from hacking. It’s no wonder that this profession has grown 12 times faster than any other job—and the demand is expected to grow to 6 million globally by 2019. With such a global need for cybersecurity professionals, there’s truly no better time than the present to become an expert in this exciting and advancing field. With the Dual Degree IMBA and Master in Cybersecurity, students will learn how to deal with cyberattacks and security incidents, as well as gain the high-level management skills required to lead companies forward and drive impactful change. You’ll gain a solid foundation in management through the IMBA, then dive deeper into the field of cybersecurity to drive meaningful change—in any company of your choosing. At IE, we believe that future leaders must balance in-depth knowledge of their field with advanced leadership and communication strategies. This Dual Degree brings both of these worlds together, allowing students to broaden their knowledge base in both management and cybersecurity while putting their skills to the test with hands-on learning methodologies. Our rich ecosystem of diverse academic and professional backgrounds ensures that students broaden their perspectives, while building up an impressive network of contacts. 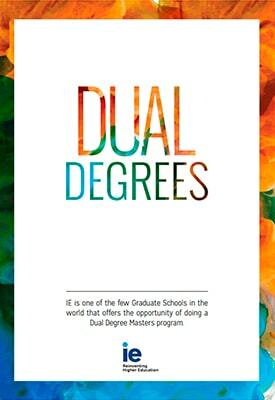 Upon completion of this Dual Degree, you’ll be in the best possible position to take your career to the next level. Cybersecurity shortage is a complex issue that we all must approach from an educational perspective. High-level education is fundamental in training the next generation of cybersecurity professionals. We rely on HST’s Master in Cybersecurity to provide great talent.